By definition, leaders are change agents. Whether it’s launching a new program, entering a new market, or restructuring an organization, leaders have to navigate complex change. 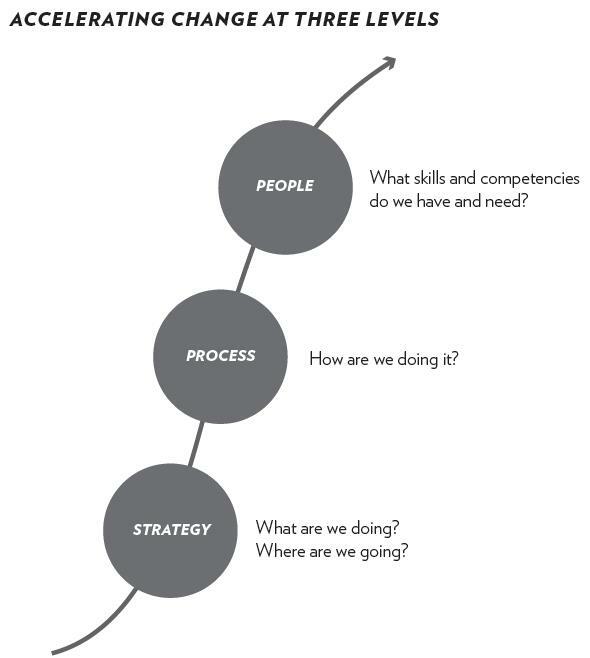 To do this well, it’s useful to think about the fact that change needs to be managed effectively at three different levels: the strategic level, the process level, and the people level. Leaders that accelerate change at all three levels will outperform everyone else—hands down! At the strategic level, leaders should be continuously scrutinizing the environment and determining how best to capitalize on strengths and opportunities, how to minimize weaknesses and threats, and how to prepare for possible disruptions to their business model. They should be having honest, open discussions about how best to deploy resources to take advantage of opportunities and counter any threats. They should be setting clear priorities about how to best serve their customers, and making the needed adjustment in terms of services, products, business lines, organizational capacity, and structure. Most importantly, they should be communicating changes in direction and priorities so that employees across the organization know what’s going on. At the process level, leaders should focus on honing business processes to be sure they are as effective and efficient as possible. They should be monitoring performance and making adjustments to improve quality, reduce cycle time, and optimize the use of resources. Finally, at the people level, teams and employees need to receive communication about what’s happening – plus specific communication about how expectations for them are going to evolve. If job duties are going to change, they need to know they’ll receive the training they need to be successful. Change at this level hinges on regular communication of expectations, frequent feedback (both appreciative and constructive), and coaching. People often have a hard time processing change or understanding why it’s necessary, which leads to resistance. This framework can help you communicate change effectively. Start at the strategic level and explain the external factors driving your decisions. Then explain what it means at the process level, and how it will impact specific departments and programs. Lastly, explain what it means at the people level. If you can add why this will make people’s jobs better or more interesting, so much the better. Learn more about how to accelerate the pace of change in my new book, The Leadership Equation: 10 Practices That Build Trust, Spark Innovation, and Create High-Performing Organizations.